The following items are shown as examples and are not for sale. Buy Wyammy Ranch fleeces and create your own. 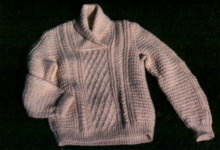 The fisherman knit sweater is hand combed, three plied, Romney ram fleece. The lustre of Romney wool is enhanced by combing. 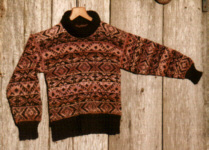 The Fair Isle sweater is carded Romney cross wool. 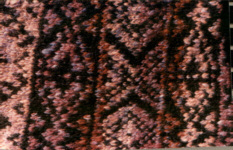 The background is natural dark brown, and the colored design wool was made by changing colors as the yarn was spun for one ply and using a single color for the other ply. 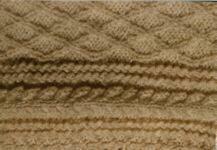 Romney wool felts well for graments, rugs, saddle pads, and wall hangings. Felted pieces are also for sale. Contact us for items currently available.